According to the Heart and Stroke Foundation, more than 66,000 Canadians died of either a stroke or of heart disease in 2012. That is the equivalent of one death every seven seconds. A stroke occurs when a blood clot prevents blood flow to the brain. This leaves important brain cells without oxygen, impairing functions such as memory and muscle control. The effects of a stroke can vary based on severity, but even minor symptoms can still leave people weak in their arm or leg. More severe strokes can leave people completely paralyzed on one side of the body and completely disabled. The frightening part of having a stroke is that there is no prior warning. However, the good news it that strokes can be prevented, and one key element to this is your diet. Here are some food items that have been negatively associated with an increase in stroke risk. 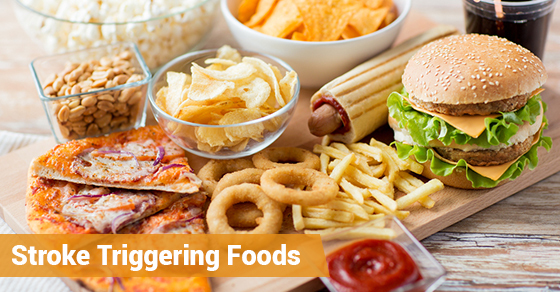 Processed foods or junk foods, such as crackers, chips, store-bought goods and fried foods, typically contain a lot of trans fat, a very dangerous type of fat because it increases inflammation in the body. It is this increase in the inflammation of the body, a foundation of many diseases, that is linked to an increased stroke risk and also many other serious, life-threatening diseases as well. There are certain preservatives found in smoked and processed meats — namely sodium nitrite and nitrate — that damage your blood vessels and thus increase your stroke risk. Not only that, but nitrates convert into nitrosamines which have been linked to certain cancers as well. Examples of smoked and processed meats include hot dogs, bacon and salami. Ideally you would limit smoked and processed meats completely from your diet. However, if this cannot be done, at least ensure that you limit their quantities, as well as ensure that your meat is grass-fed, organic, free of nitrates and is labelled as 100 per cent beef. By salt, this means processed salt found in packaged foods and table salt. Natural, unrefined salt, such as Himalayan salt, is not associated with an increased stroke risk and can be used to flavour food. In fact, natural salt can even help to regulate your blood pressure. Stroke patients can greatly benefit from personalized care. C-Care Health Services offers a variety of affordable, personalized and high-quality services. Contact us today to learn more.